An eBook is an electronic version of a book. An eBook allows users to read publications on any screen with a browser that supports Flash. An eBook looks similar to a print book with all of the layout, figures, and images intact. You can read your eBooks online. You also can read them on a number of devices, such as an iPhone, iPad, and android devices. For more information, see App Download Instructions. You will need to create an account to purchase and read an eBook. Once logged in, you can add the eBook(s) you want to your shopping cart and place your order. Once your purchase is completed, the eBook(s) will be added to your bookshelf, and you can start reading the eBooks in your account. Maximize the productivity of cutting. Linear regression equations for converting Rockwell, Vickers, Knoop, and Scleroscope hardness numbers into Brinell hardness numbers. Formulas and linear regression equations for calculating ultimate tensile strength of the most commonly used work materials in relationship with their hardness. Formulas for calculating the number of inserts simultaneously engaged with the workpiece depending on milling conditions. Formulas to calculate machining time when facing, cutoff, and deep grooving and for feed and radial forces in relationship with tangential force. Set of formulas to calculate overhang of boring bars made of tungsten heavy alloys and cemented carbides in comparison with a boring bar made of steel. 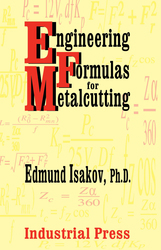 Formulas for metal removal rate and for calculating tangential and axial forces. Establishes power constant values for most commonly used work materials.